It's your first priority, but child and pet safety is often the last thing you think about when choosing window coverings. 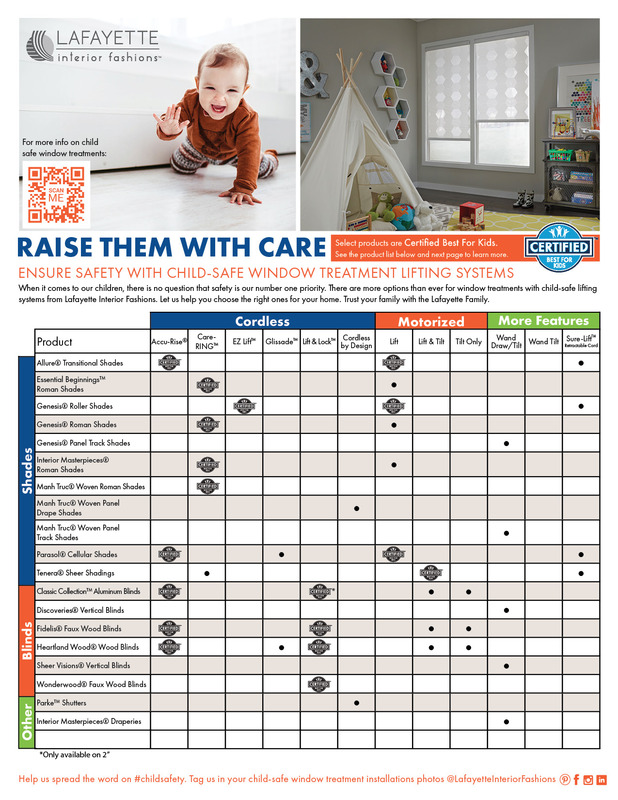 Did you know that the most common window products in homes are not child safe? Those horizontal blinds that were there when you moved in are a potential strangulation hazard for your little ones. As our infographic shows, accidents still happen with those long cords. For kids' sake, we offer a wide array of lifting system options, from cordless and motorized operating systems to retractable lift cords, cord tensioners, and wand controls for enhanced child and pet safety. We also send our products to be tested and certified as Best for Kids™. The newly launched best for Best for Kids™ certification label makes it easy for parents and caregivers to identify products that are best suited for their home. We are not stopping there! We still send products to be tested, so be sure to check this page for updates. The window covering industry uses warning tags, labels, and other methods to communicate potential hazards. The warning shown here communicates the important message that cords are a potential strangulation hazard and suggests choosing cordless or inaccessible-cord alternatives. Together with the Window Covering Safety Council, we encourage you to install only cordless window coverings in rooms where children play and sleep. All Lafayette products that utilize a clutch system are sent with a Cord Tension Lock. The Cord Tension Lock must be secured to the wall to provide the necessary tension for the shade to operate. All motorized window treatment products offer child safe operation since the motor unit provides the mechanism for raising and lowering the shade. For additional information and repair kits for older window covering products, please visit the Window Covering Safety Council.